Paush Khichda or Sweet Dal Khichdi is a classic, healthy, old-fashioned porridge-like dessert from the city of Jaipur. This dish is typically served during the Paush Maas (December/January). A sticky texture or cooked rice, with light velvety moong dal along with sweet and salty flavours make this Posh Khichda a feast. khichda/Khichdi is an Indian dish made with rice and lentils. Rice and lentil combination food is very popular in Indian subcontinent, and that’s why Khichdi is loved throughout India, by every age group. Khichda/khichdi is considered to be a superfood, and due to nutrients value some even call it the queen of all one pot meals. In other words, anytype of khichdi is a perfect example of a comfort food because of the taste, and the ease of cooking this dish in a single pot. What is Paush Khichda, aka Sweet Dal Khichdi? 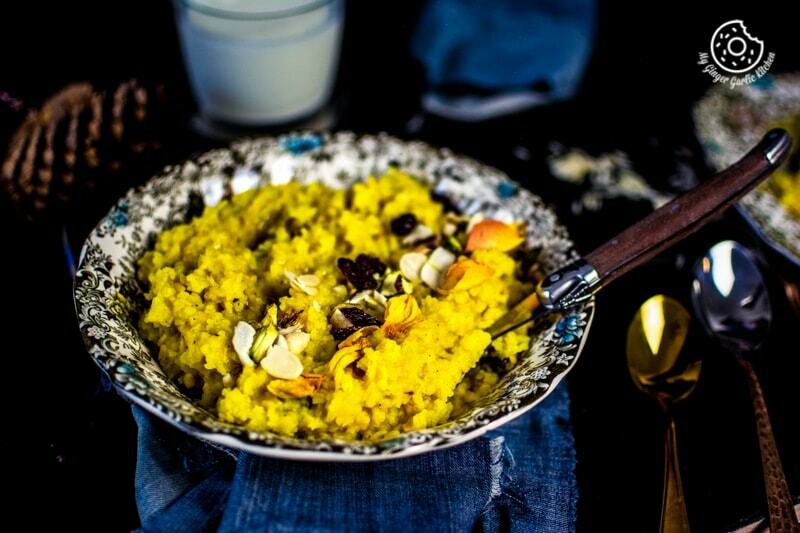 Posh Khichda or Sweet Dal Khichdi aka meethi dal khichdi dessert is made during Paush maas (winter time). Yellow Moong dal and rice are cooked together with salt, turmeric, and sugar. This is flavored with aromatic ghee, a lot of nuts, and raisins for richness and flavored with cardamom powder. The little bites of moong dal along with the soft mushy rice make this sweet dal khichdi very flavorful and delicious. Paush khichda has a similar consistency of dal khichdi — a humble meal of rice and lentils in itself. It is very simple to make but tastes quite unique and delicious — simply amazing. At my home, this sweet and salty Posh khichda was prepared only during the months of December and January. So you can say it is like a festive food. It’s nothing fancy, but has some strong religious sentiments. How do you serve Paush Khichda? You can eat it as an after-meal dessert, breakfast, or as a snack. I love eating it as a dessert. This is best served with spicy snack Paush Vada. This is a very simple dessert which can be made instantly in a pan, stovetop pressure cooker, or an Instant Pot. How to cook this Paush Khichda (aka Sweet Dal Khichdi) in a pan? You just rinse rice and lentils and soak them for 30 minutes. After soaking, add rice and dal to a deep pan along with the water. Add salt and turmeric, give it a nice stir and let it come to a boil. Once boiled, turn the heat to low, and add sugar. Mix well again and cook covered for 30 minutes. Lastly, add ghee, nuts, raisins and cardamom powder for the perfection. Cook for 2 minutes. Drizzle with some ghee and garnish with nuts. Enjoy hot or warm. How to cook this Paush Khichda | Sweet Dal Khichdi in a pressure cooker? Add soaked rice, dal, water, salt, and sugar to a pressure cooker. Let it come to a boil. Add sugar and mix well again. Cover the lid and pressure cook on high for 6 whistles. Let the pressure cool off before opening the lid. Add ghee, nuts, raisins and cardamom powder. Cook for 2 minutes. Top it with some ghee and dress it up with some nuts. Enjoy hot or warm. How to cook this Paush Khichda | Sweet Dal Khichdi in an INSTANT POT? You just rinse rice and lentils and soak them for 30 minutes. After soaking rice and dal, add it to the instant pot liner along with salt, turmeric and sugar. Cover the instant pot with lid, set the valve to sealing position. Cook on manual (high pressure) for 6 minutes. NPR (Natural pressure release) for 8 minutes. Once pin drops, open the lid. Press sauté mode and cook for 2 minutes. Add ghee, nuts, raisins, and cardamom powder. Then cook for 2 minutes. Mizzle with some ghee and garnish with nuts. Done! Enjoy warm or hot. Paush Khichdi or Meethi dal khichdi is an excellent dessert when guests are coming over, or when you want to satisfy your sweet cravings but don’t want to spend too much time in the kitchen. What type of rice is best for making Khicha? I have used long grain basmati rice, but you can use any of your favorite rice for making Paush Khicha. This recipe of Khichda is not overly sweet because I added 1⁄3 cup of sugar for 1 cup dal and chawal. Traditionally, more sugar is added to this khichda recipe. If you like, you can increase the amount of sugar. The traditional recipe calls for sugar, but you can definitely replace the sugar with jaggery for a healthier version. Khicha is served warm or hot. Turmeric is added to this recipe because it is considered to be auspicious in Hindu mythology. Besides, it also gives a nice golden color and has cold-healing properties. In khichdi the rice grains and lentils are separate, they are slightly mushy. This khichda has a thick porridge-like consistency. It thickens as it cools, so you can adjust the amount of water according to your taste preference. Ghee plays an important role in this dish, so I would highly recommend not to skip it. However, you can use unsalted butter if you can’t find ghee. But Khichda/khichdi with ghee tastes the best. This khichdi is usually prepared in a deep-bottomed pan, but you can easily replicate this recipe using a stovetop pressure cooker, or an Instant Pot. 1. In a bowl add the moong dal, and rice. Rinse it well. 2. Add 3.5 cups of water and soak it for 30 minutes. 3. In a deep-bottomed saucepan, add the soaked rice and lentils along with the water. 4. Add 1 teaspoon of turmeric powder, and 1 teaspoon of salt. 5. Stir well and let it come it a boil over medium-low heat. 6. Add 1/3 cup sugar and stir well again. 7. Cover the pot with a lid and cook for about 30 minutes over medium-low heat. 8. Open the lid and stir well. 9. Partially cover the pan and cook for 8 more minutes. 10. To check if the khichda is cooked, press the rice and lentils between a spatula and a spoon. 12. Add 3 tablespoons of ghee and mix gently. 13. Now add cardamom powder, chopped nut, raisins, and mix well. 14. Cook for 2 more minutes. 15. Transfer into a serving bowl. Drizzle with some ghee and garnish with chopped nuts. 16. Serve warm or hot. 3. Add soaked rice, dal, water, salt, and sugar to a pressure cooker. 4. Let it come to a boil. Add sugar and mix well again. 5. Cover the lid and pressure cook on high for 6 whistles. Let the pressure cool off before opening the lid. 6. Add ghee, nuts, raisins and cardamom powder. 7. Cook for 2 minutes. Top it with some ghee and dress it up with some nuts. 8. Enjoy hot or warm. 3. After soaking rice and dal, add it to the instant pot liner along with salt, turmeric and sugar. 4. Cover the instant pot with lid, set the valve to sealing position. 5. Cook on manual (high pressure) for 6 minutes. NPR (Natural pressure release) for 8 minutes. Once pin drops, open the lid. 6. Press sauté mode and cook for 2 minutes. Add ghee, nuts, raisins, and cardamom powder. Then cook for 2 minutes. 7. Drizzle with some ghee and garnish with nuts. Done! Enjoy warm or hot.